Dan took Raven out for her exercise today. 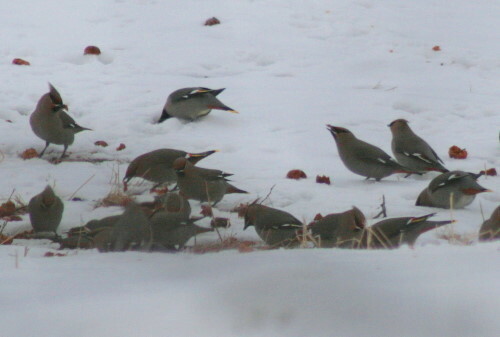 When he came back in, he called up to me to say that there was a large flock of Bohemian Waxwings down near our little pond. He said they seemed to be sticking around, so I grabbed my camera and he was kind enough to take me back to where he’d seen them. When we got back there, they were gone. We paused and listened, wandered around a bit, but there was no sign of them. 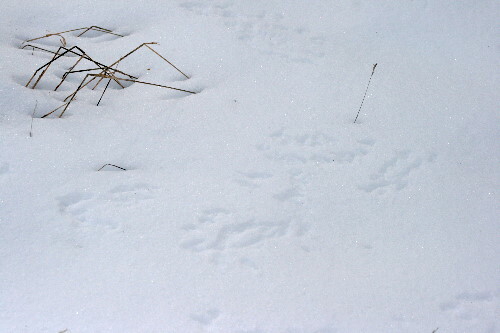 The only evidence of their passing were little footprints in the snow where they had been coming down to the ground. They’d apparently been doing this while Dan was watching them, but it wasn’t really clear what they were interested in. Today was a somewhat mild day and snow fleas were out in force, so I wonder if they might have been plucking the springtails from the surface of the snow. Although their diet in the winter is mostly fruit, this is primarily because insects are hard to find, and they haven’t adapted to eating seeds. We wandered back through the woods along the edge of our fields, popping back out near the house. As we started to cross the meadow, Dan paused, thinking he might have heard something. All I heard were feeder birds, tree sparrows, and we took a few more steps before Dan decided no – those really were waxwings he was hearing. Sure enough, a flock – the same ones? – had alighted in a tree on the far side of the house. There were fewer than when he first saw them, so if they were the same, who knows what happened to the rest. I snuck up to their tree and watched them for a while, taking a few shots from underneath. Then I went back to the house to see if Dan’s video camera was handy, as I wanted to try to record all the noise they were making. Turned out the battery wasn’t charged, so I couldn’t get any video, but when I went back out they’d left the treetop anyway, and were swooping down to the ground on the neighbour’s property. When I got back over there I could see what they were feeding on. Fallen fruit, probably apples judging from the size of them. They were actually digging them out of the snow and then pulling pieces off once they’d got them to the surface. The ones scattered on the snow have already been pulled out. 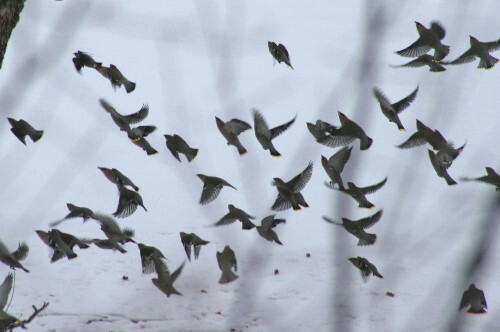 They were somewhat flighty, never seeming to stay on the ground more than ten or fifteen seconds at a stretch, but they didn’t go far, just flying up to the top of the apple tree they were feeding under. I got much better looks at them this encounter than I did last time I saw them (I wonder if these might even be the same group?). Normally they hang out high in the crown of a mature tree, and you’re always looking up at their underside. That’s where we first found them. But of course, when they come down to the ground to feed they’re at eye-level, and even at some distance away it’s still a better view. You can see their yellow lightning stripes much better in these photos. They’ll probably be here for another month or so, perhaps sticking around into April before they start making their way north to their breeding range. The tundra and northern taiga where they nest will still be frozen well into May. 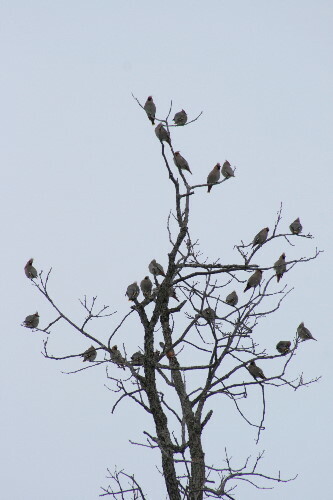 The waxwings won’t start nesting there till late May or early June, by which time some of the birds around here, such as robins, might already be fledging a brood. 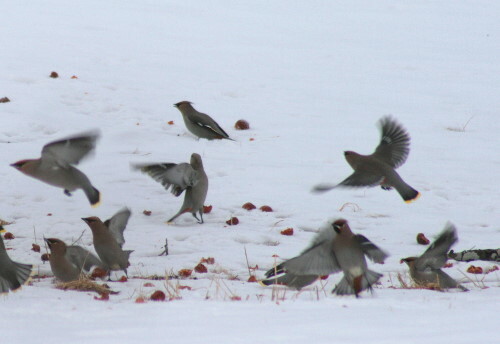 There’s no rush for the waxwings to be heading back, in any case, so they’ll stay till the snow starts melting here and then follow the melt north. Since they showed interest in the neighbour’s apples, they might hang around till the fruit are gone. I’ll have to keep an ear open for them. 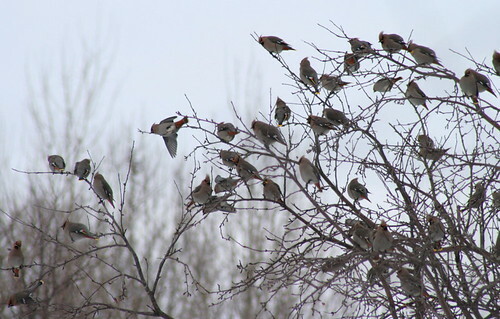 Seabrooke, is there anymore more stunning than a large flock of Waxwings? I only see the Cedars and I’m wondering if the Bohemians “whisper” like the Cedars do. Thanks, Mary! I definitely agree. 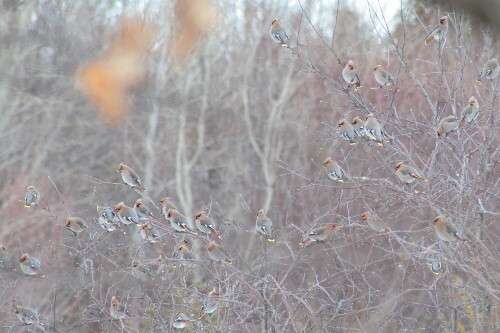 One of my favourite things about the waxwings is the noise they make as a large flock. Next time they come round I’m hoping to get some video with sound. Oh, how lucky you are! One of your pictures reminds me of the cover of Gill. Hee. That’s true, Barefootheart, it does. These photos are great! 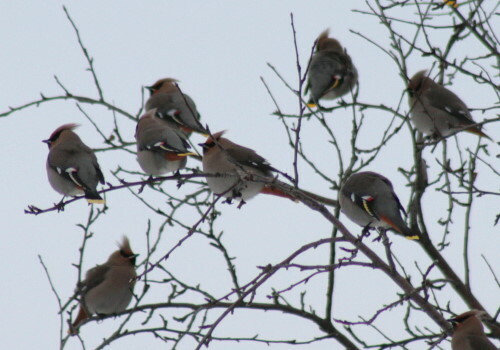 Very sharp, of a whole flock at a time, giving a wide variety of postures to study. Thanks, Lavenderbay! I love flock photos, it’s neat to browse through and look at all the individuals. How exciting – and great pics. I saw bohemians for the first (and last) time here in Newcomb about four years ago. 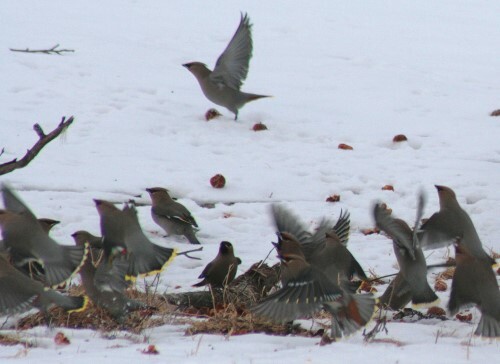 I remember thinking “those are a bit big for cedar waxwings…and they are rather grey…and the call they are making isn’t quite right for cedars.” Sure enough – they were bohemians. Nifty birds. Thanks, Ellen. That’s not too different from my own first encounter. They’re similar enough that it takes a moment to be certain. They’re both very beautiful birds. It’s quite interesting that they dredge up fruit from beneath the snow. I wouldn’t have guessed that, though it seems reasonable. And I’m jealous of your photos. The only time I ever saw them was almost two decades ago before I realized how important it was to keep a camera with me. I ‘oohed’ and ‘aahed’ and later cursed myself for having no images. I’ve not been back that far north since then. Thank you! And that would be so like birds, Jason! Any time I hear something and say to my companion, “hear that bird?”, invariably it shuts up. Or a bird that might have been hanging around all day will disappear when you try to show it to someone. I’ve got a lot of bird (and other) encounters like that, too. Most notably, I wish I had a) been a better birder and b) had a better camera when I went down to Ecuador a number of years ago. I had a great time and saw lots, but there’s so much I wish I could do over now that I’m a little better in both departments! Hopefully Peru (if it’s a go) might provide some chance to make up for earlier missed opportunities.